Consider 480V switchgear with a 32 mm (1.26 inches) gap between conductors and 7 kA prospective 3-phase bolted fault current at its terminals. The gear is being protected by LPJ400SP Class J 600A fuse located upstream. 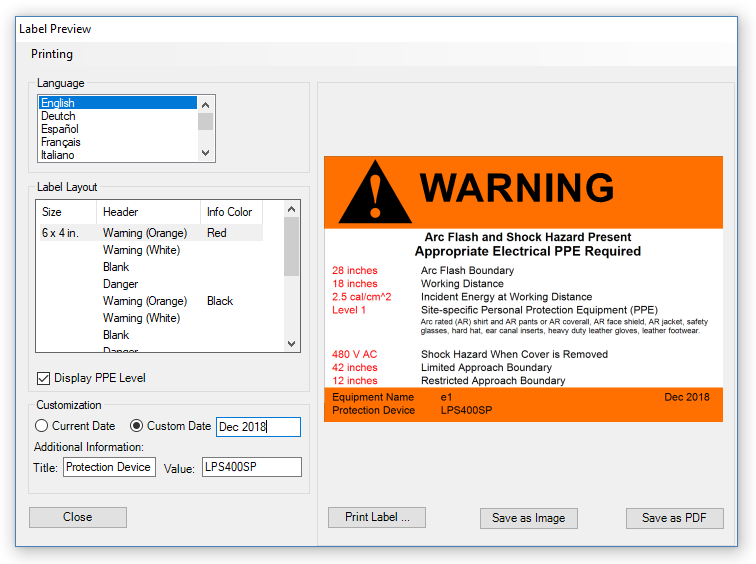 Incident energy at working distance, arc flash boundary and personal protective equipment (PPE) rating will be calculated based on IEEE 1584 - 2018 Guide for Performing Arc-Flash hazard Calculations. First, we start with specifying Enclosure Dimensions, Electrode Configuration, Gap between Conductors, Working Distance, Available 3-Phase Bolted Current (ASCC), Part of the ASCC through Protection Device and System Voltage. The program will automatically determine Predicted 3-phase Arcing Current through Protection Device and Reduced Arcing Current through Protection Device, and substitute the calculated current values in matching text boxes. Next, select protection device type and part number from Upstream Protective Device drop down list. The program will automatically determine arc duration both at the predicted and at the reduced arcing current, and substitute the values into the corresponding Arc Duration text boxes below. 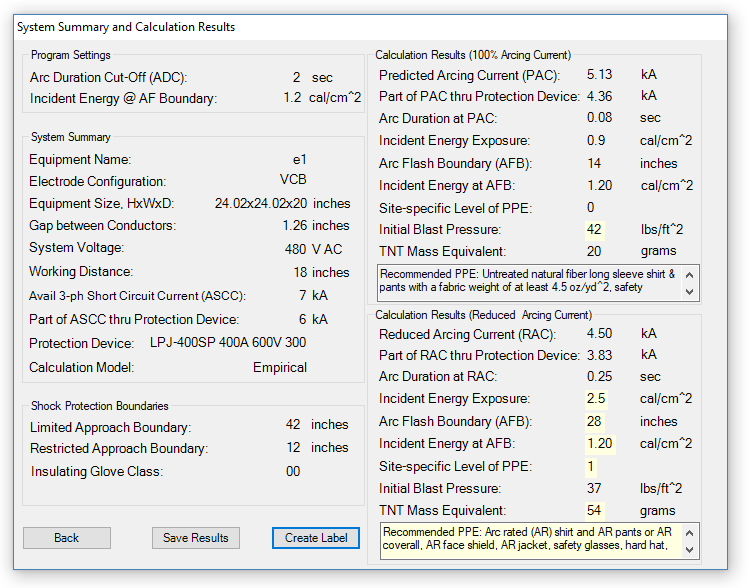 NOTE: You can always click on Library menu and add fuse or circuit breaker data including time-current characteristics for the devices that are not already listed in the built-in protection device library, or select Not Listed option and enter in arc duration data manually. System Summary and Calculation Results screen will appear when [Calculate] button is clicked on. The screen displays calculation results both for predicted and reduced arcing current with worst case scenario highlighted. By pressing [Save Results] button, the results will be saved to a text file for future reference or printing. You can save results for different jobs under different names. By choosing Open from File menu (see Figure 1 above) you can open an existing results file, inspect its current content etc. If you need more complex editing, import the file into your favorite text manipulation processor (MS Word as an example) and do what you need to do. Click on [Create Label] button to get to the label preview screen. Select label size, language, header type, text color and click on one of the [Save] buttons to save the label in one of the available electronic formats. You can also click on Printing menu item to fine tune printing options, preview and print the warning label. You can fine tune units of measurement for input and output data by clicking on Units from Settings menu. 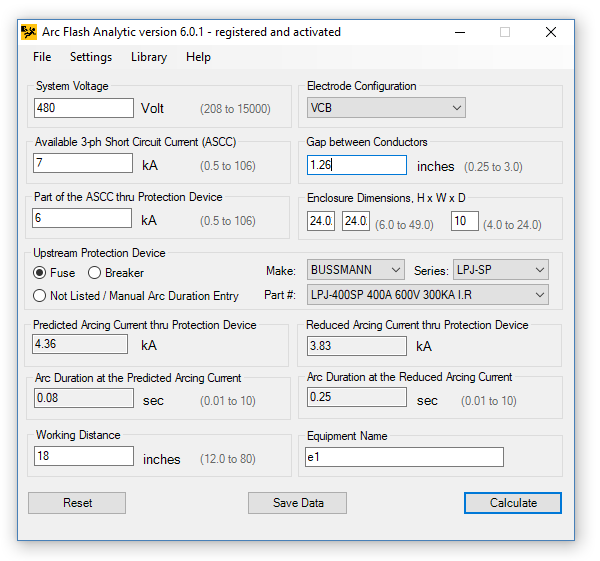 The AFA V6.0 also allows you to adjust arc duration cutoff, incident energy at arc flash boundary values, save equipment configuration for future referencing and analysis, and more. Please check the program Help for more information.